Welcome to Word-Filled Wednesday, hosted this week by Penny at Pennyraine. Be sure to stop by her blog for more visual inspiration from scripture. Friends (both local and virtual) are such a HUGE part of my life. As many of you know, I met several of my virtual ones at the FaithWriters conference last month. This is a picture of me and my incredible, wonderful, amazing soul sister/twin separated at birth/brain-sharer Patty "Peejers" Wysong (she's the Patterings gal) at the conference. She is absolutely, positively THE best - and she's been working at her local fair the past week or so, and we haven't chatted in years (LOL a slight exaggeration)! Miss ya, sweets! Be sure to stop by Pennyraine for more . Oh, how special!! I'm so glad the Lord allowed you guys to meet! 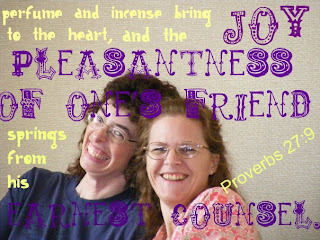 God is so gracious to bless us with friends! I miss her, too, Jo! True friends are so precious--for always! Doesn't it AMAZE you the connections that can be made when God is in the middle of it all...I too have made some blessed connections out here...women who encourage and uplift...amazing! How WONDERFUL ya'll got to hug! Peej is one of THE best, for sure but so are you, Jo. Great picture. yep this is great post for frienship...Nice entry. mine is ready. Beautiful post on the blessings of friendship. I love Patty's blog! I love your new look, JO! I also love that picture of you and Peej. Absolutely precious, my friend. You two encourage me as well. Love you! Awh!! What a sweet tribute! You're such a great friend. Aw, Jo! You're gonna make me cry!! Waaaaa!! I miss you too!! It's the pits. Really and truly. And let me tell ya--Jo is telling the truth. It's like we were really were separated at birth. Jo is a gift straight from God to me.